Reverse Osmosis – What is it? How does it work? This is a two section article. Both are offered here. Section #1 is a simple overview. Section #2 offers in-depth information. Reverse Osmosis. 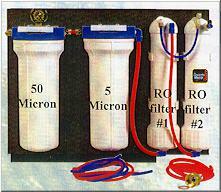 RO is a filtration system that is used to clean tap water. It is used before water is added to the aquarium. 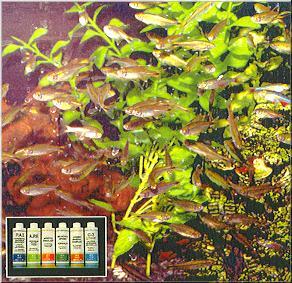 High purity RO product water is excellent for use in fresh water aquariums. RO water is ideal to use for mixing marine salts. It is not an aquarium filter. Reverse osmosis, RO filtration has been promoted in the aquarium industry since the early 1980’s. Aquatic Nature RO filterUpper left is 50 micron pre-filter. Lower left is 5 micron pre-filter. Right RO chamber. This unit produces up to 35 US gallons each 24 hours. 1) Tap water must have a minimum of 80 PSI in order to allow the RO system to work properly. 80 PSI (pounds square inch) usually produces 25 US gallons of finished or product water every 24 hours. 105 PSI usually produces 35 US gallons of finished product water each 24 hours. Higher PSI will increase the yield of finished or product water and will not harm a properly designed RO filter. If your water pressure is too low, or you wish to install larger sized RO filtration systems, you must install a water pump after the pre-filters and before the RO membrane. Commercial RO filtration systems typically operate with 150-190 PSI. 2) Tap water must be pre-filtered so the RO membrane will not plug with items found in most tap water supplies. An optional high quality carbon chamber or module can be installed to remove color, gases and odor in most tap water. Next in line is a 50 micron filter. This removes the heavy impurities found in most tap water. Next in line is a 5 micron filter. This removes fine impurities before water enters the RO membrane. The 50 micron and 5 micron filters should be changed every 1 -4 months depending on the amount of heavy particulate collected. 3) The pre-filtered water now enters the RO chamber. 90%+ of undesirables are not allowed to pass through the RO membrane. 10% of the water is considered premium water. Rejected water (90%+) is either discarded, or used to feed another RO membrane. Rejected water from the second membrane is either rejected or used to feed a third and final membrane. If multiple membranes are employed, product water is increased and waste or rejected water is reduced. 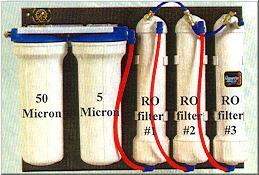 4) RO filters should be used on a regular basis to avoid reducing the life of the filter. Product water should be tested on a regular basis to ensure the filter is operating a peek efficiency. When the filter wears out, replace it. Aquatic Nature RO filterLeft to right: First is a 50 micron pre-filter. Second is a 5 micron pre-filter. Third is the first of two RO chambers or modules. Fourth is the final RO chamber. The fourth RO chamber is fed with rejected or waste water from the third module. This unit produces up to 50 US gallons each 24 hours. There are no uniform standards for water quality in the US. There is the same amount of water on planet earth as there was 50,000 years ago. A lot of toilets have flushed a lot of waste back into our basic water supply. Chemical contaminants, pesticides, insecticides, heavy metals, fertilizers, etc. continue to degrade the quality of our fresh water supply. RO filtration has proved to be a most valuable asset in dramatically improving our water quality. RO water is vastly superior and lower in cost vs. most bottled water for human consumption. It is obvious that RO water will help the vast majority of fresh water aquariums. RO water is excellent for use in hydrating marine salts. Not all RO filters are the same. They may look similar, but the quality of the components and workmanship is paramount. Most small or home sized RO filters sold to aquarists are produced by one or two manufacturers in the US. Numerous companies advertise and sell these units with their own name sticker or label. These simple sellers of RO units have little or no understanding of what this equipment is and how it functions. Most simple sellers of RO units are continually beating on the prime manufacturers for lower and lower prices. The result can be a low quality filter that cannot withstand operating under water pressure and providing long trouble free service. Reverse osmosis filter system are relatively costly. It is better to choose an RO system that is made from high quality parts and assembled by skilled craftsmen. This filter system is connected to a cold water outlet. It operates under water pressure. Economy versions of a quality RO unit can come apart, flood a room and cause extensive damage. Economy filters may not operate as advertised or meet your needs and expectations. When selecting a reverse osmosis filter system, always choose the best available. Aquatic Nature RO filterLeft to right: First is a 50 micron pre-filter. Second is a 5 micron pre-filter. Third is the first of three RO chambers or modules. Fourth is the second of three RO chambers. The fourth module is fed by the waste or rejected water from the third RO module. The fifth RO module is fed with rejected or waste water from the fourth module. This unit produces up to 100 US gallons each 24 hours. The heart of the RO system is its special filter. The filter is a semi permeable cellulose acetate membrane. That is a film-like material that has microscopic holes that allow water to go through the membrane in one direction only. The membrane has holes that measure 5 Angstroms. An Angstrom is a unit of measurement. There are 254,000,000 Angstroms in one linear inch. An electronic scanning microscope is required to see the holes in the filter. Water entering the RO filtration system must be pre-filtered, before entering the membrane chamber. If tap water is allowed to go directly into the RO chamber, it will rapidly plug and ruin the membrane. 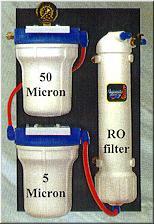 The best RO filtration systems use two to three pre-filters. Product water from a reverse osmosis filter system yields ultra premium quality water for fresh water fish and planted aquaria. RO water in the aquarium removes various impurities found in tap water. Control is gained if using additives to accommodate diverse captive aquatic pets. Optional pre-filter. This is a chamber that uses a high quality activated carbon. This removes color, gases and odors from water. This should be changed every 3-5 months depending on the amount of water produced. Pre-filter #1 uses a 50 micron filter element. This removes rust, slime and dirt found in most tap water supplies. This should be changed every 1-4 months. Pre-filter #2 uses a 5 micron filter element. This removes fine silt and other small particles that can plug the RO membrane. This should be changed every 1-4 months. Water then enters the RO filter. The RO filter operates on a unique principal. Pre-filtered water enters the RO chamber under pressure. The pressure is usually a minimum of 80 PSI (pounds square inch). That is about 15-20 US gallons per minute. Less than 80 PSI is insufficient to push water through the membrane. Pre-filtered water now enters the RO membrane chamber. The 5 Angstrom RO membrane filters out 90%+ of heavy metals, pesticides, insecticides, toxins and other undesirables from incoming water. The 10% of the incoming water that is allowed through the RO membrane is ultra clean. This is what successful aquarists use for fresh water aquariums and to mix marine salts. 90% of the water is rejected, or not allowed through the membrane. This rejected water is passed by the filter and discarded. 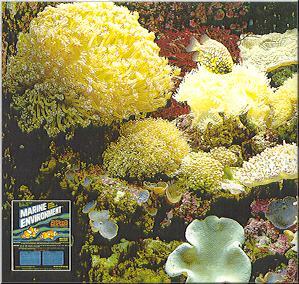 Delicate corals and all marine animals thrive in a premium marine salt, hydrated with the clean water produced by a quality reverse osmosis filter system. Each RO membrane produces between 25 – 35 US gallons of product water every 24 hours, depending in large part on pressure in the system. The variable in product water production is a factor on incoming PSI. Multiple RO membrane chambers can be connected in series to produce more product water. The rejected water from the first RO membrane can feed a second RO membrane chamber. This will double the capacity of product water and reduce the waste by about 25%. A third RO membrane chamber can be fed with waste water from the second RO unit. This will triple the total capacity from using a single RO membrane. This will reduce the waste or rejected water by about 50% from a single RO unit. Three membranes is the maximum that can be used with this type of system. RO membranes must be operated either continually or on regular intervals during each 24 hour cycle. RO membranes should not be used for a day or two, then allowed to sit for days or weeks at a time. If not used on a regular basis, bacteria that is trapped inside of the RO chamber will prematurely erode the membrane. Membranes should be checked regularly for performance with a conductivity meter. Testing tap water with a conductivity meter will show exactly how much dissolved solids are present in the incoming water supply. Testing finished or product RO water should indicate a 90% reduction dissolved solids. When finished or product water tests higher than 10% of non-filtered tap water, or there is an increase in water passing through the filter, it is time to change the membrane. RO membranes with proper usage can last a few years. Be skeptical of RO product claims that indicate their filters last indefinitely.